Contact lenses are easier and more comfortable to wear than ever before due to new lens designs and materials, as well as advanced care products. Millions of people have already discovered that contact lenses are much more comfortable and convenient than they had ever imagined. Choosing the right lenses for you can be confusing, so let us guide you through the options on these pages. Of course everyone’s eyes are unique, so our expert staff will be happy to give you personal help and advice, and to answer any questions you may have. That way you’ll feel totally confident with your new choice of contact lenses. 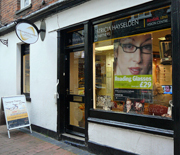 If you would like to wear contact lenses, we can provide everything you will need. If you do not have a current prescription, you will need to have an eye examination prior to the contact lens consultation. During the consultation the optician will examine the surface and sensitivity of your eyes to check that contact lenses are suitable for you. They will also take into account a wide range of factors such as a proposed wearing schedule, visual needs, work environment and lifestyle etc., before deciding which lens type and care regime to recommend. An optical lens advisor will show you how to insert and remove your lenses. You will be shown exactly what to do, and will have plenty of time to practise your technique until you are fully confident. You will also be taught how to care for them, keep them in good condition and clean them. It’s simple – putting contact lenses into your eyes and taking them out again takes just a few seconds when you know how! Handling your lenses becomes second nature very quickly. It is imperative to keep your aftercare appointments and rigorously follow the advice and hygiene instructions to ensure successful contact lens wear. Once you are an established contact lens wearer, you will still need to have an annual or 6 month check to monitor the health of your eyes. Even with these frequent checks, you will still be required to have an eye examination when recommended, as it is important to keep your spectacle prescription and glasses up to date. You should always have a pair of glasses to wear in case you get an eye infection, lose a contact lens or are instructed to stop wearing the lenses.